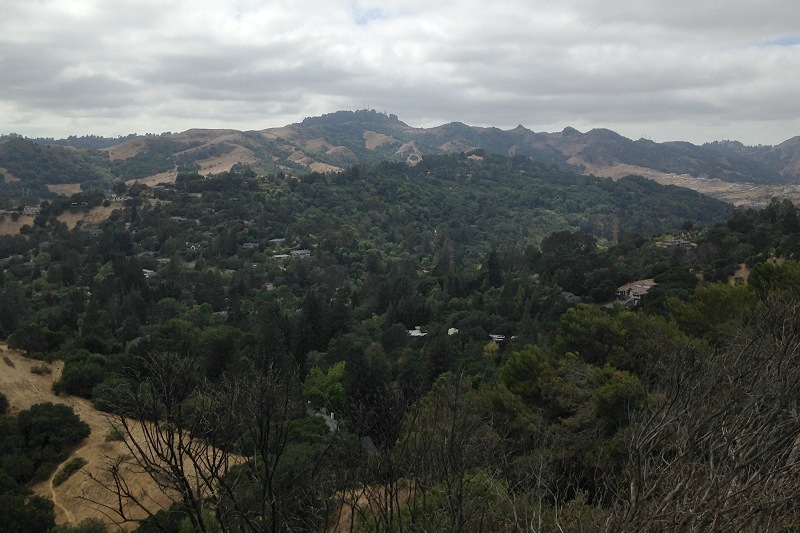 Over the last couple years, I’ve been more and more tempted by Mulholland Hill, the ridge shared by Moraga and Orinda that dominates its area and shelters the former village of Rheem. Tempted because I crave summits, but also tempted because its rocks, named the Mulholland Formation, are interpreted as the youngest in the region. 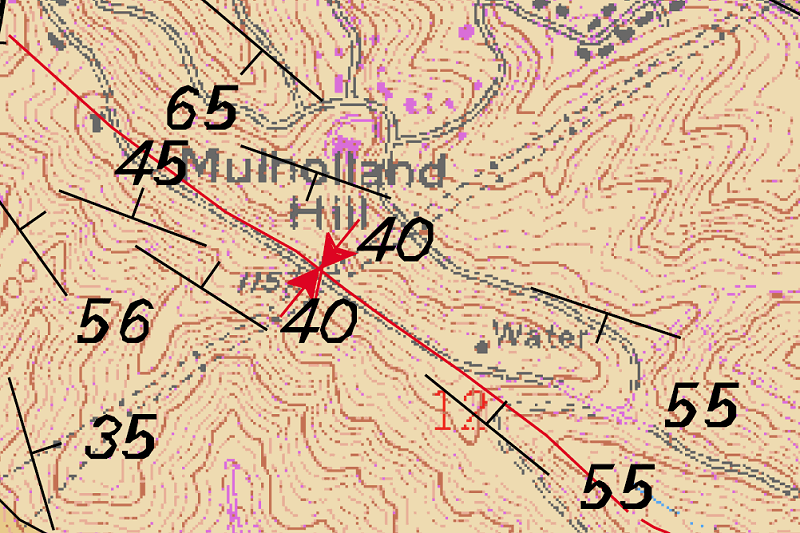 The Mulholland Formation is mapped in two shades of light tan on the geologic map, due east of Oakland. 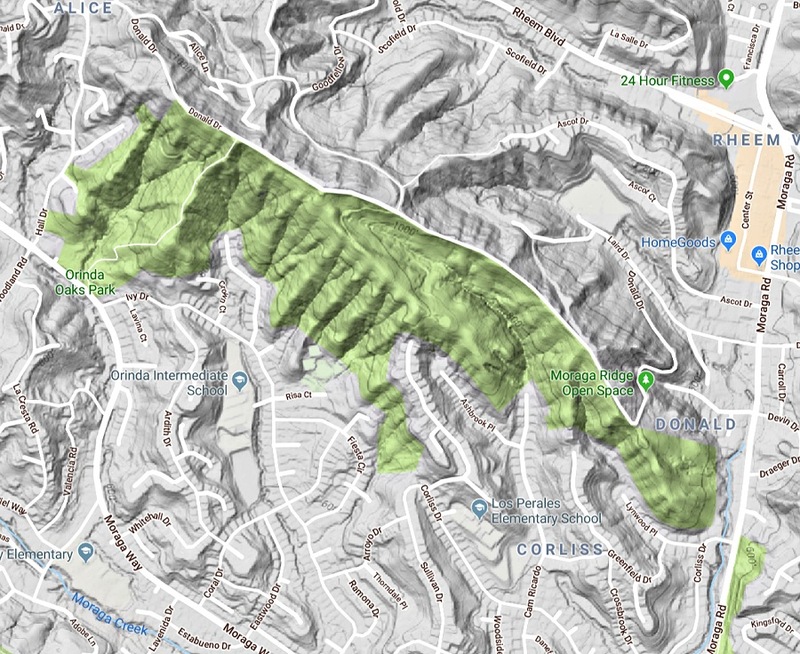 It extends from downtown Orinda past Moraga and into the watershed lands to the south; a finger of it (not shown) sticks beyond the rest across Cull Canyon and all the way to Crow Canyon. Mulholland Hill sits in the northern part. Much of it is preserved as open space, and that’s where I went to see its rocks. But first, what does it look like? 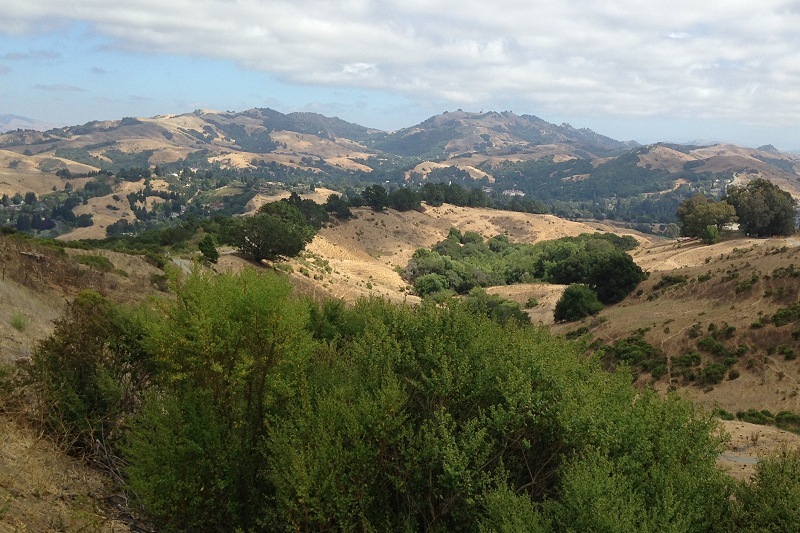 This 2016 view east from the ridge above Wilder Valley shows Mulholland Hill’s level top just in front of Mount Diablo; the grassy ridge dominating the view is another hill that overlooks Lost Valley. This February 2018 view north from Redwood Ridge shows Mulholland Hill against the horizon left of center, dotted with homes and trees. 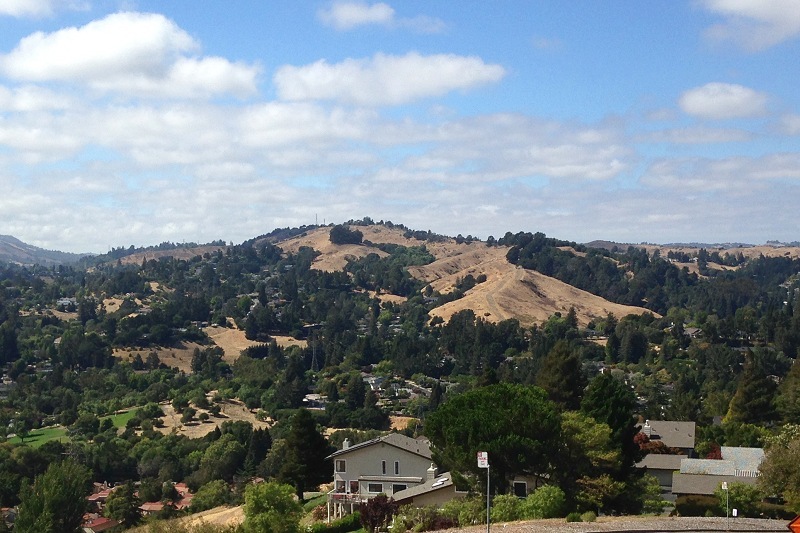 And the second looking northwest from Alta Mesa Drive in Moraga last week. 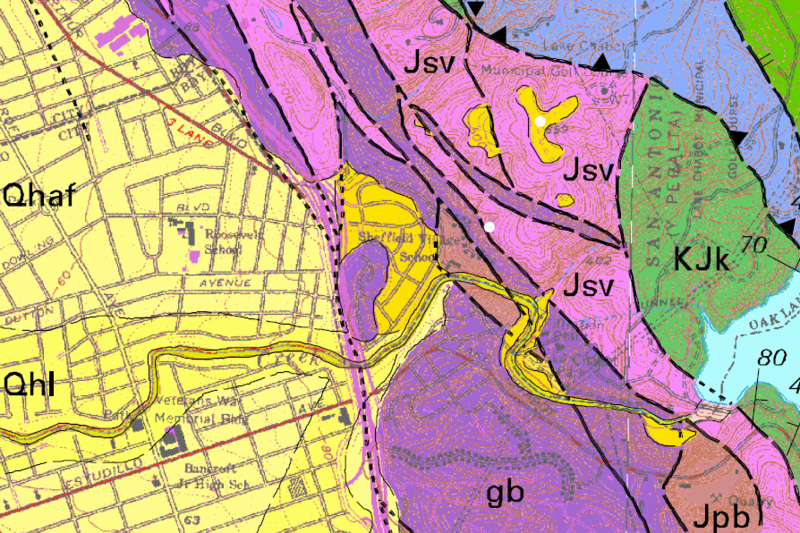 Here’s a closer look at the geologic map between downtown Orinda at top left and downtown Moraga at bottom right, showing the north half of the Mulholland Formation that underlies Mulholland Hill. The formation is divided into upper and lower parts (Tmlu and Tmll respectively). Notice how the lower part flanks the upper part on both sides. That’s because the whole thing is folded like a taco, so the older rocks wrap around the younger rocks — a configuration called a syncline. The upper rocks have more sand and gravel in them and resist erosion better than the muddier lower rocks. The paved trail is the middle part of Donald Road; you can get to the open space on Donald Road from north or south. I came up from the south and recommend that unless you’re in a hurry. Along the way you may see cattle. 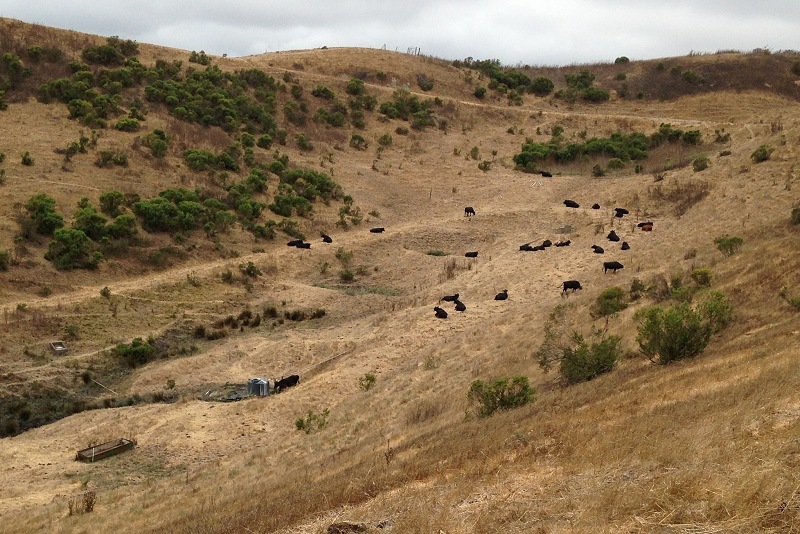 Moraga originated as a cattle ranch in the 1840s, so these represent an old tradition. For all I know, Moragans still fill their household freezers with artisanal grass-fed Moraga beef. 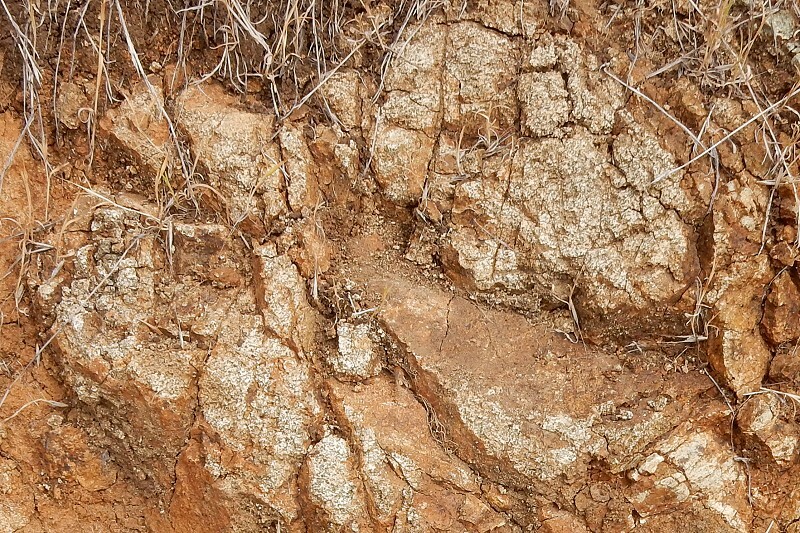 Get off the pavement to see bedrock poking through the soil. It’s coarse sandstone with a fair share of pebbles. 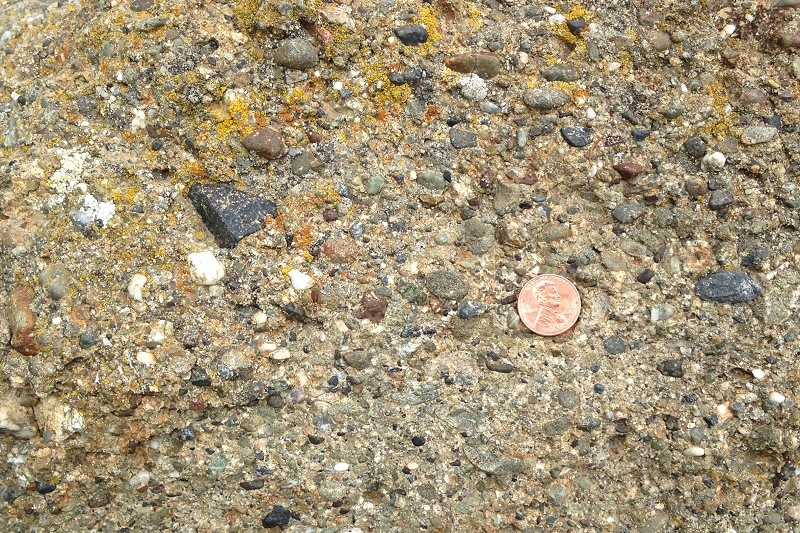 Elsewhere it’s full-fledged conglomerate, mostly pebbles that represent a variety of different rock types. 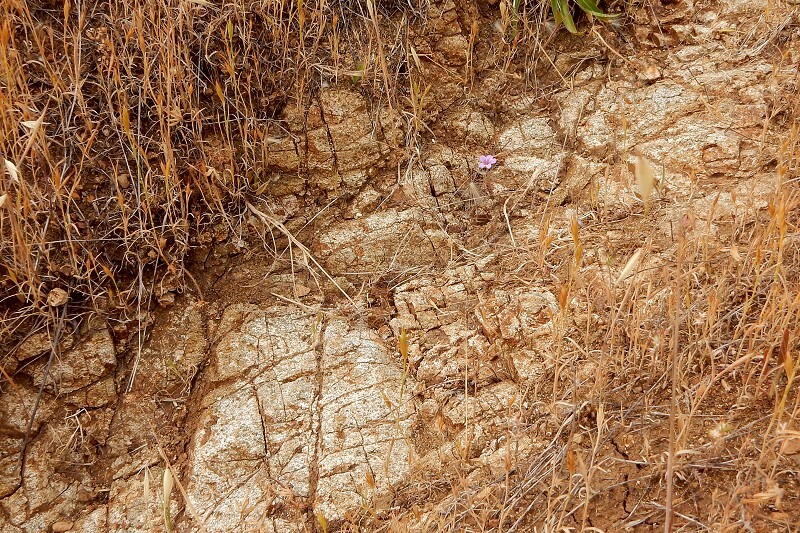 These rocks are interpreted as freshwater deposits, laid down by a vigorous river draining hilly terrain. Nearby exposures of this unit contain horse bones and teeth and plant leaves that fix its age around early Pliocene time, some 5 million years ago. A fine place to visit. It’s also prime raptor habitat — but if you’re a birdwatcher you probably already know about it. I’m tempted to return. 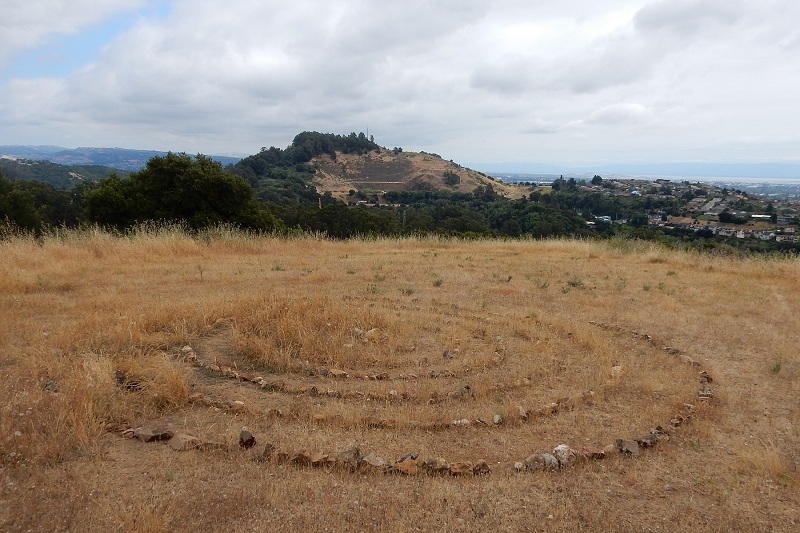 I have believed — and what’s worse, repeated — that Oakland’s highest point is Grizzly Peak. In fact, the highest point within the city limits is Chaparral Peak, an eminence so subtle you can barely tell it’s there. 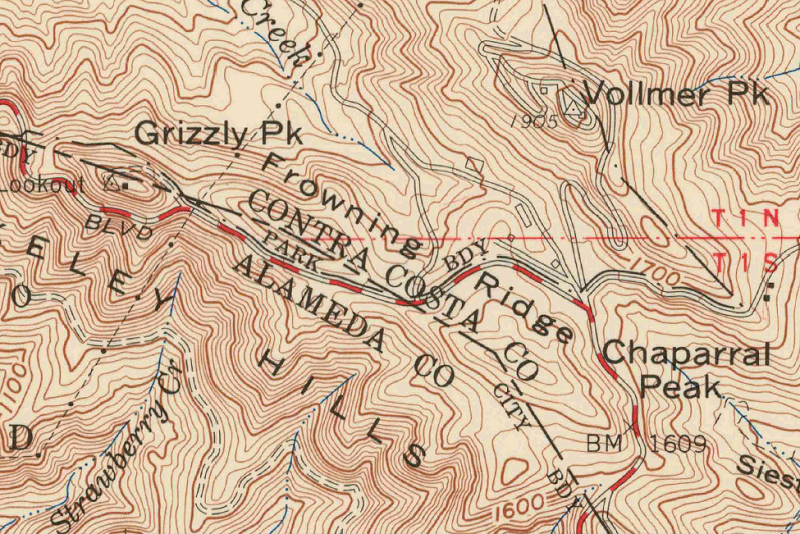 Let’s look at the 1959 topo map of the high Berkeley Hills. Everything south of the county line is in Oakland. 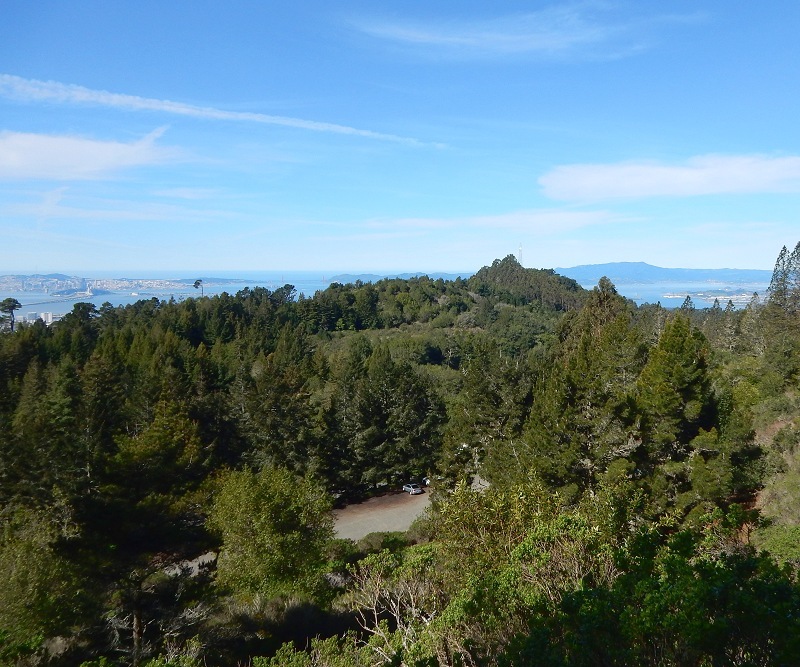 Grizzly Peak stands out, at approximately 1745 feet. Figures differ, so don’t quote me on that. But Chaparral Peak definitely rises above the 1760 foot contour, making it a hair over one-third of a mile above the Bay. Here’s the mountaintop, such as it is. 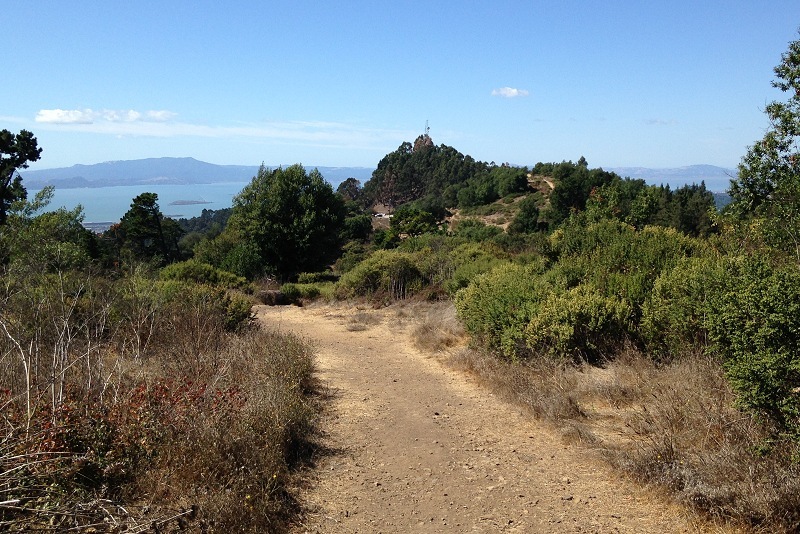 It’s Oakland’s largest exposure of the Bald Peak Basalt, which extends from here beyond Vollmer Peak. Chaparral Peak is the heart of Frowning Ridge, a name we don’t use much (and I’m not sure we ever did). Frowning Ridge is an ill-defined set of peaks and eminences running from Grizzly Peak to Chaparral Peak and then down Siesta Valley where it’s cut off by a fault. This is the view upridge to Grizzly Peak. 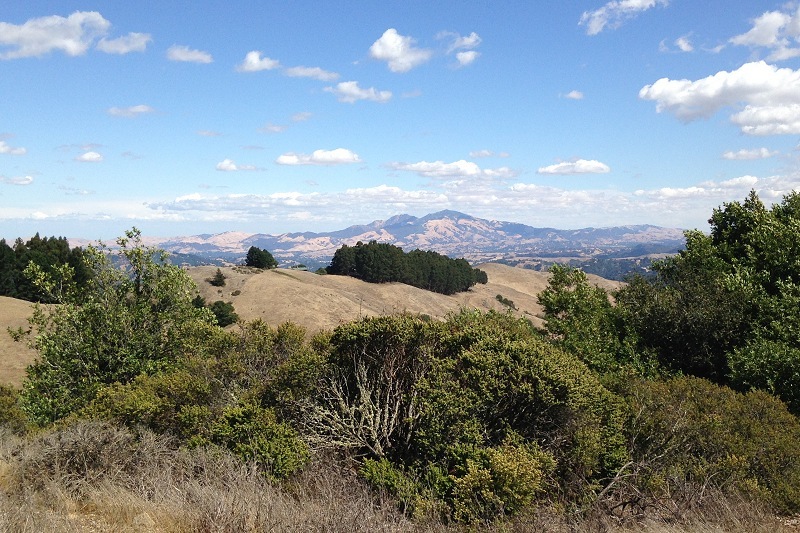 Mount Tam is in back, on the left. 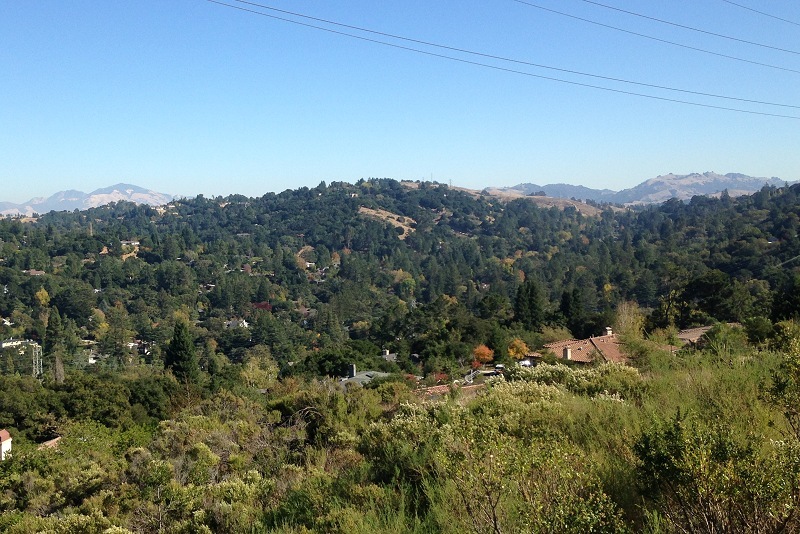 And this is the view southeast to the Oakland Hills. Round Top is in the center, against the sky, and exactly in front of it is 1684 Hill. On the right rises a nameless hill, topped by a large installation, where the county line goes. I think of these as affiliated with Gudde Ridge, on the south side of Route 24, because they line up with it. Both ridges reflect the presence of volcanic rock units. Frowning Ridge is held up by the Bald Peak Basalt and Gudde Ridge (and its northern affiliates) by the Moraga Formation. 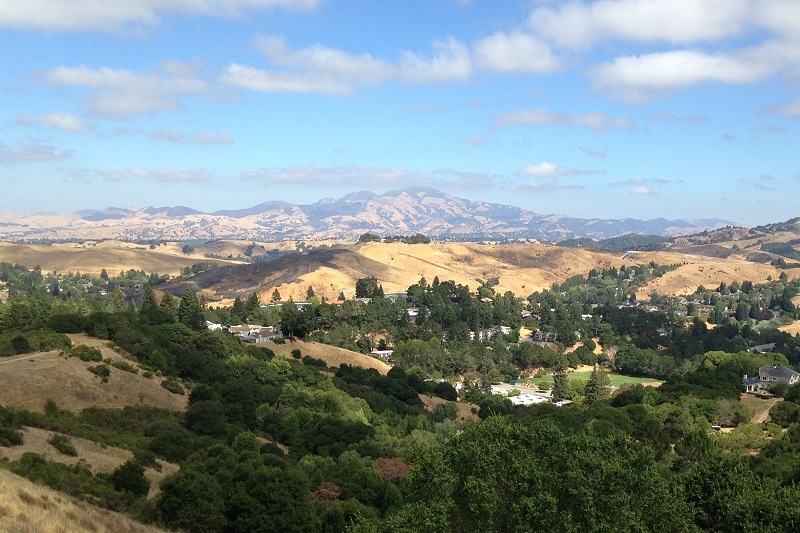 Here’s one more view, this time due east across the far flank of Siesta Valley to Mount Diablo. The Mount Diablo Base Line, the master line for land surveys in most of northern California and all of Nevada, runs right between Chapparal and Grizzly Peaks. That’s the red line on the map, with Township 1 North and 1 South on either side of it. I finally got to a sweet corner of town last week, the sunny side of Dunsmuir Ridge, this lovely hill in the Google Maps 3D view. 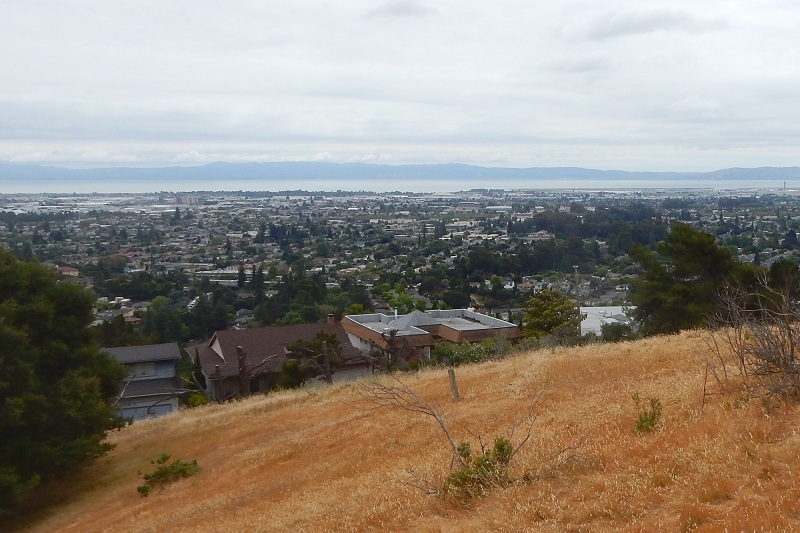 The view is to the north-northwest, such that the Hayward fault runs straight up about a thumb’s width from the left edge. 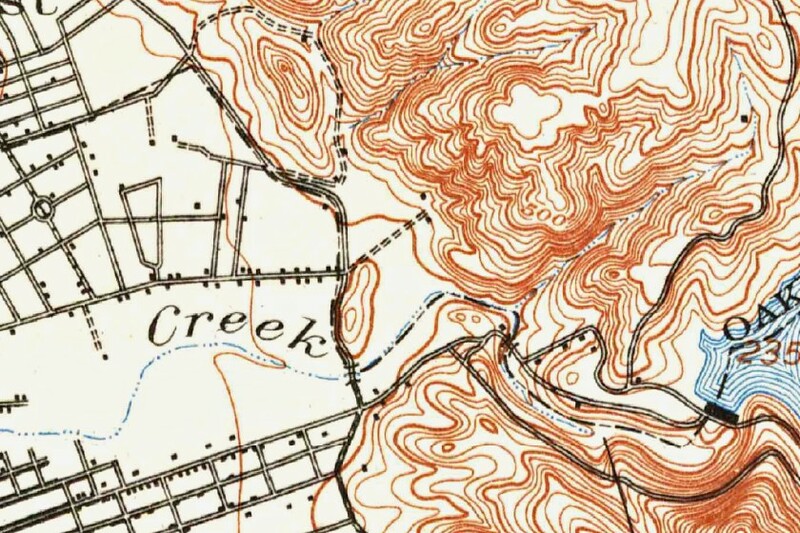 The maps below start with the 1915 topo map, in which the ridge’s top is the lobed outline of the 625-foot contour. 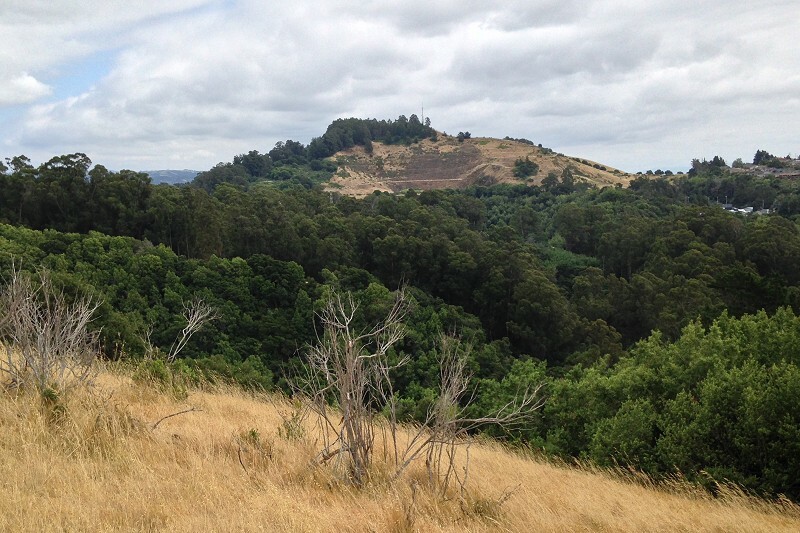 That straight creek valley along the hill’s south side — the gorge in the foreground of the top image — keeps catching my eye, but it seems to be inaccessible, which might make it Oakland’s wildest piece of land. The watershed map below may help in visualizing the hill and its surroundings. The two black dots are where the fire trail I took starts and ends. 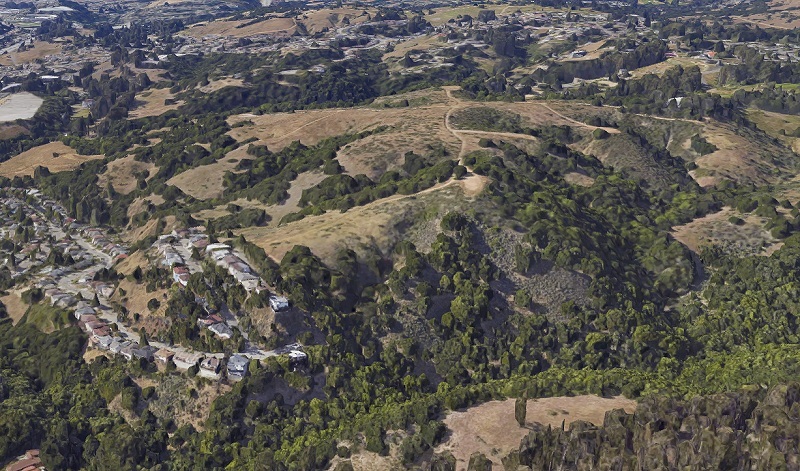 Dunsmuir Ridge is city land, rescued from development after several aborted attempts to put high-end estates on this broad hilltop overlooking (in both senses) the deadly Hayward fault. The fire trail starts at the end of Cranford Way and winds up the ridge to join the fire road from the other side, which I’ve featured here before. The walk is very scenic. 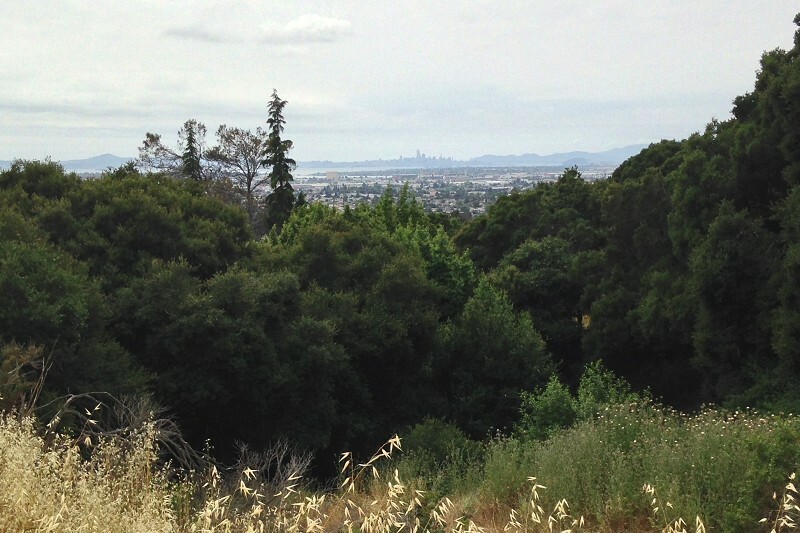 To the north, downtown rises against Mount Tam. Or if you prefer, there’s the new profile of San Francisco. Higher up, the view opens out. 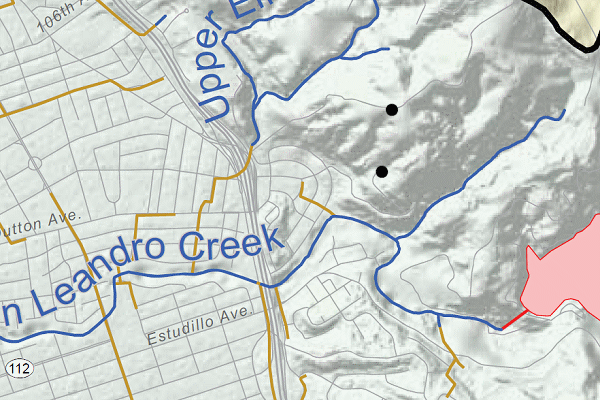 Here San Leandro Creek is made visible as a line of trees coming out of the canyon toward its mouth near the airport. But the main attraction is to the south. This is the best place to take portraits of Fairmont Ridge and its quarry scar. 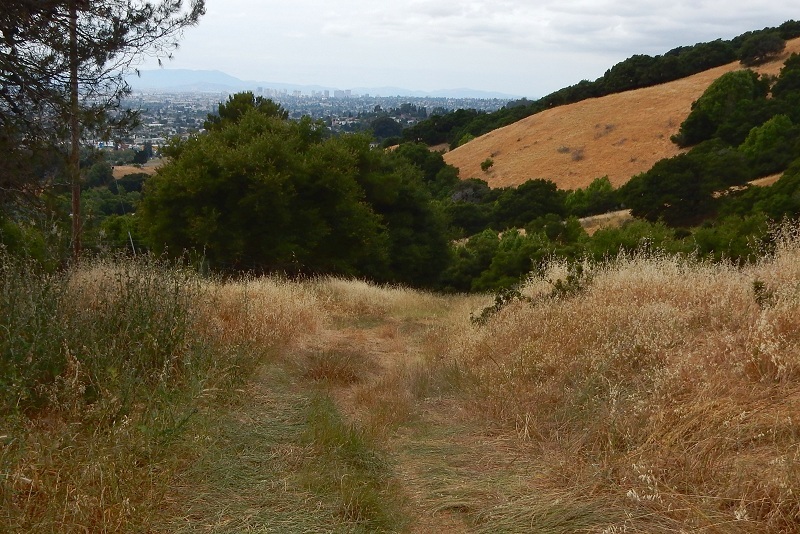 Unlike most places, this trail sets off the hill with a foreground of wild, forested land. The prominent cleared space midway up the trail — a staging pad for firefighters — has regular visitors who find the spot special. Interestingly, this spot is mapped as a patch of the peculiar Irvington-aged gravel that first brought me to Dunsmuir Ridge in 2009. However, I didn’t notice much of it, if any. 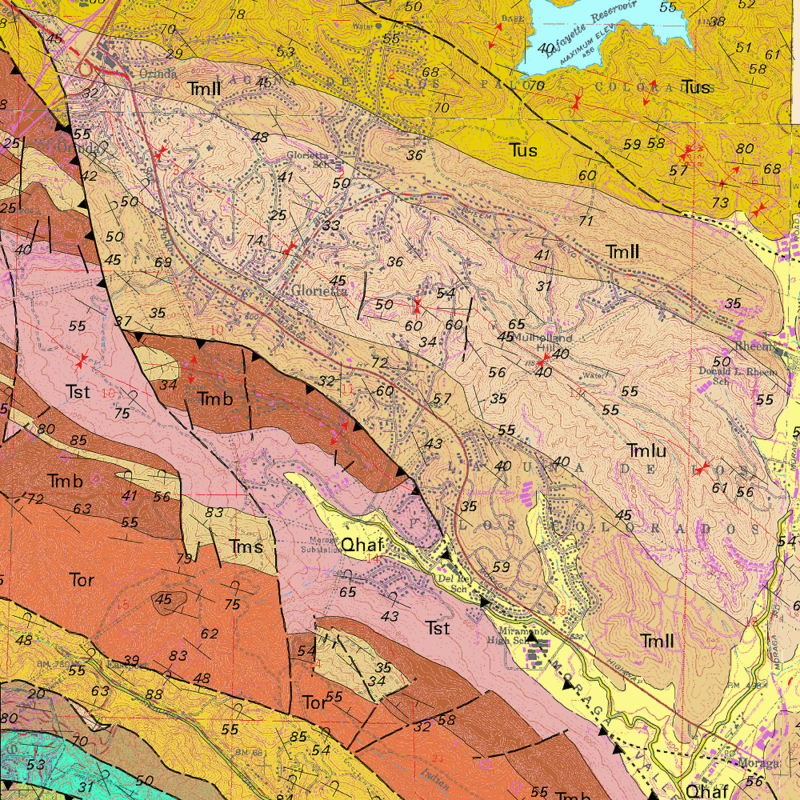 See it on the geologic map — the white dots mark the ends of the fire trail. There are rocks to be seen too. 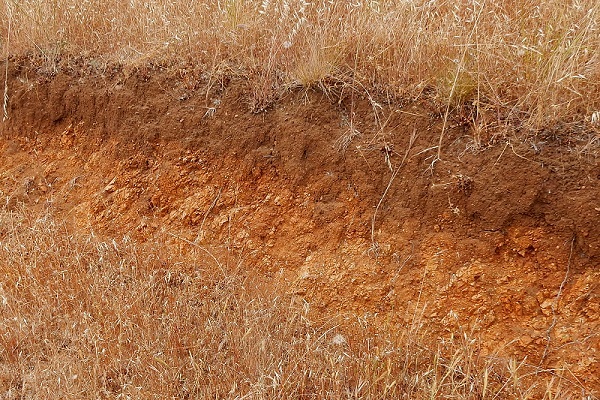 The soil is thin in most places. 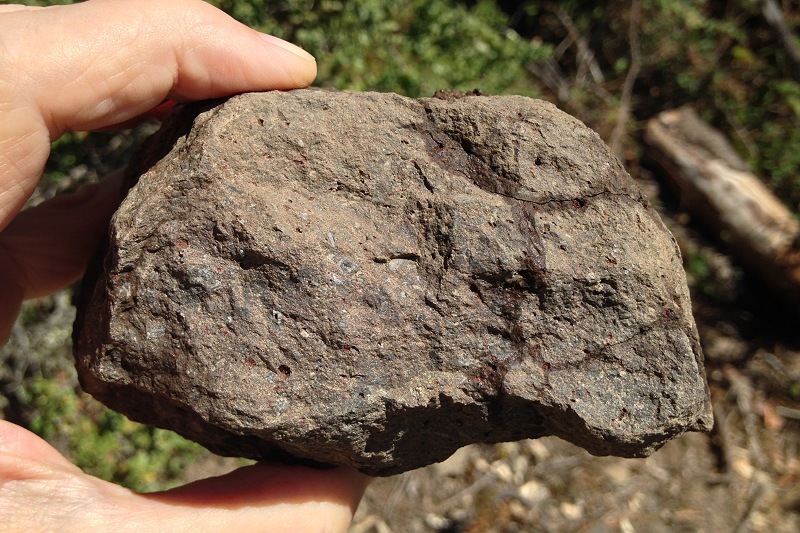 This little cut displays a profile of the soil and the decaying bedrock — saprolite — just beneath it. 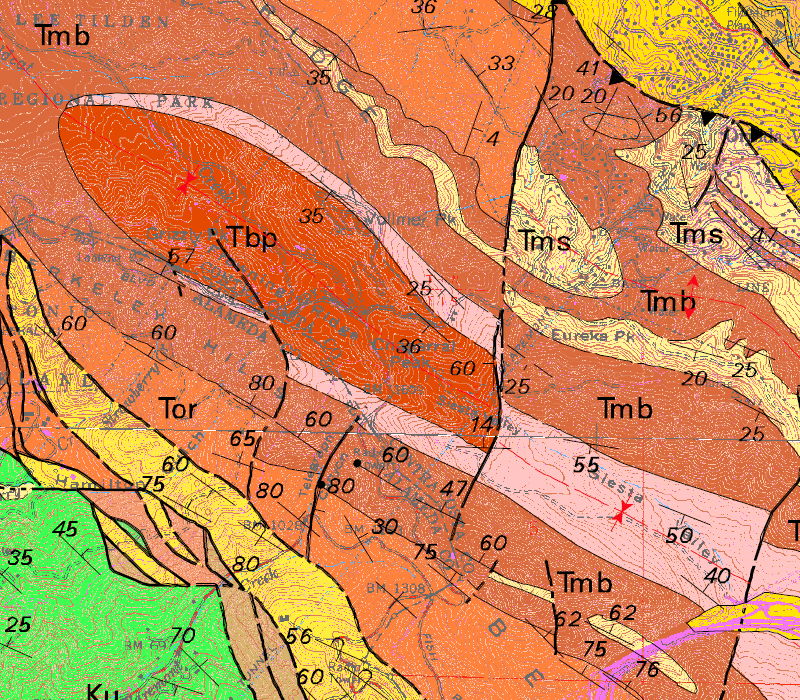 The bedrock varies, and it doesn’t match the geologic map very closely. I would say nearly all of the lower part is not Leona volcanics (Jsv) but San Leandro Gabbro (gb). It has the gabbro’s pepper-and-salt appearance but is stained orange instead of the pristine rock’s bluish gray (as I saw earlier that day in San Leandro). You’ll see it well exposed in the trail itself, where this winter’s heavy rains carved fresh runnels. If the city fills them before you get there (which it should before they become gullies), there are still roadside exposures that display the rock well, and it’s unmistakably gabbro where the map says volcanics. 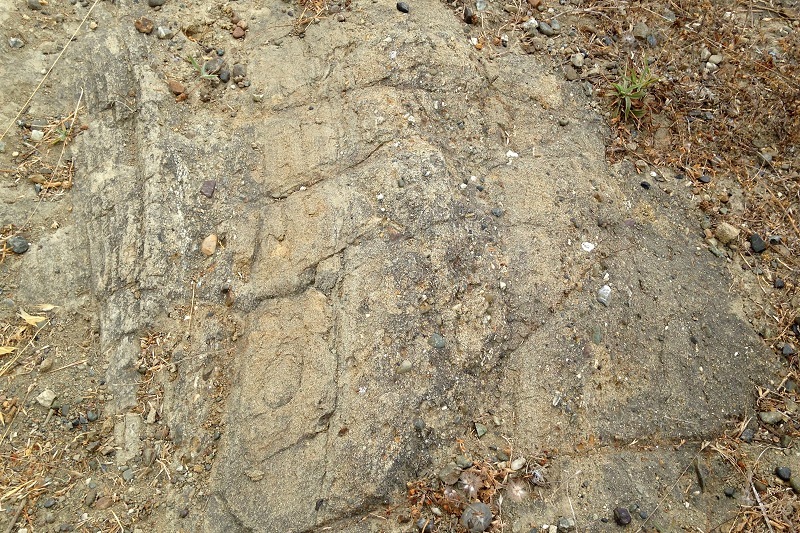 The top of the hill, though, is unquestionably Leona volcanics. My long-term plan is to revisit every bit of bedrock in Oakland and log it. Besides sheer nerdery and the chance to improve the map, my motive is to come back to views like this one over and over again. The old quarry is still for sale. Developers have tried to put houses there, but they keep getting shot down. Better, I say, for the Regional Parks District to acquire the land and develop it for quiet recreation. 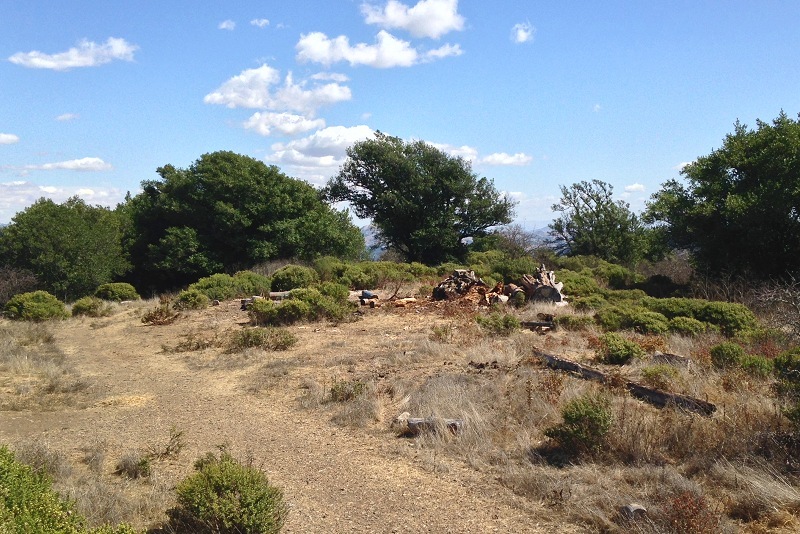 At 1905 feet above sea level, Vollmer Peak is the highest point on San Pablo Ridge and in the Berkeley/Oakland Hills. It doesn’t stand out from below — you know it by the two widely separated towers on it, to the right of Grizzly Peak — but it sure stands out when you’re on it. Here’s a view of Grizzly Peak from its upper flank. Vollmer Peak used to be known as Bald Peak, which accounts for the name of the rock unit that holds it up. 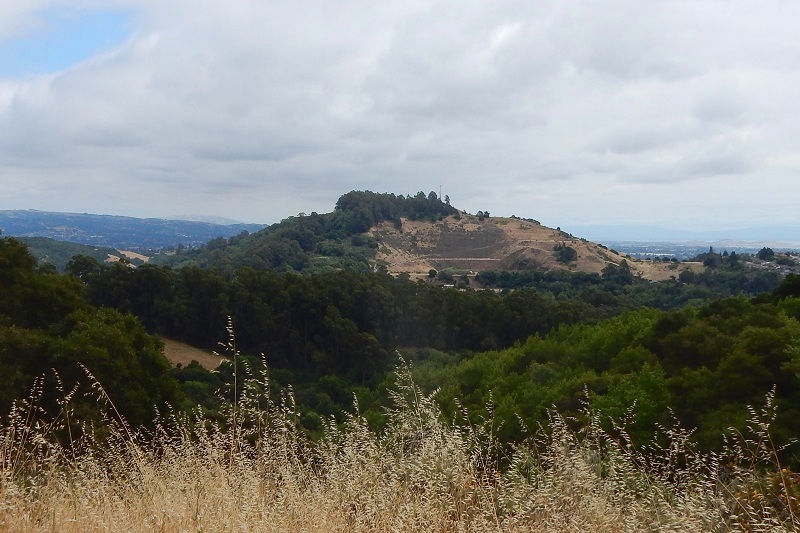 The Bald Peak Basalt is the youngest volcanic rock in the Oakland area, the well-defined reddish blob in the geologic map labeled Tbp (for Tertiary Bald Peak). 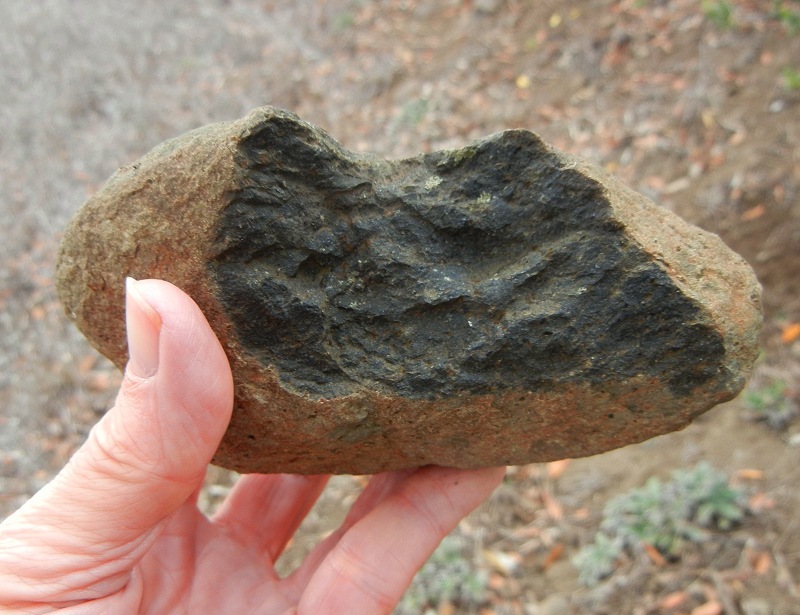 I haven’t seen a lot of this rock, but it’s described as “massive basalt flows.” Here’s an example from nearby Chaparral Peak. Notice the dark color and the light-brown weathering rind, both of which are typical. 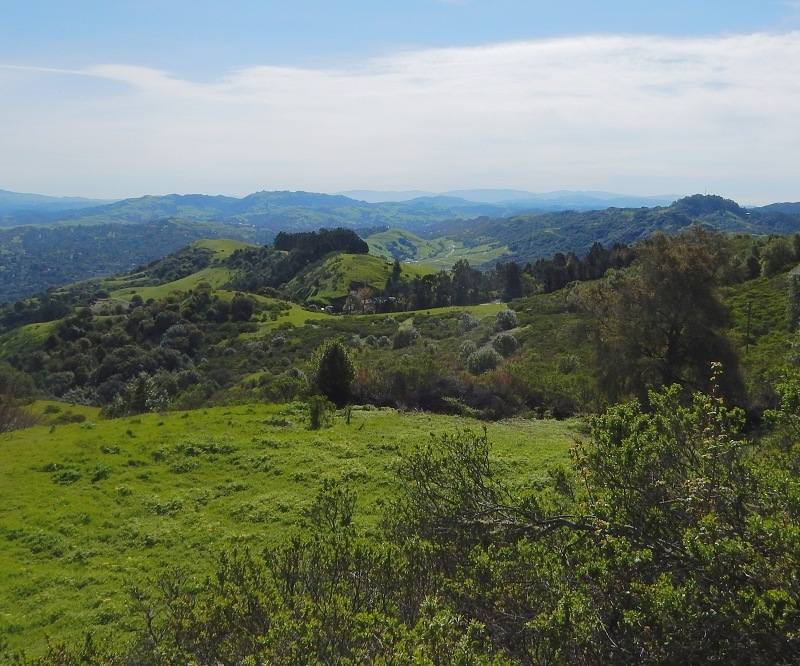 Its age, about 8.4 million years, is distinctly younger than the lava flows you’ll see at Sibley Volcanic Reserve, which are part of the Moraga Formation (Tmb) and date from 9 to 10 million years ago. The two volcanic units are separated by sedimentary rocks of the Siesta Formation, and apparently the Bald Peak and Siesta interfinger with each other in outcrops in the upper part of the Siesta Valley. It’s nice and quiet up there, and the wildflowers are in progress. The peak used to be unforested, like all the high hills, and it has remnant populations of many different meadow plants. 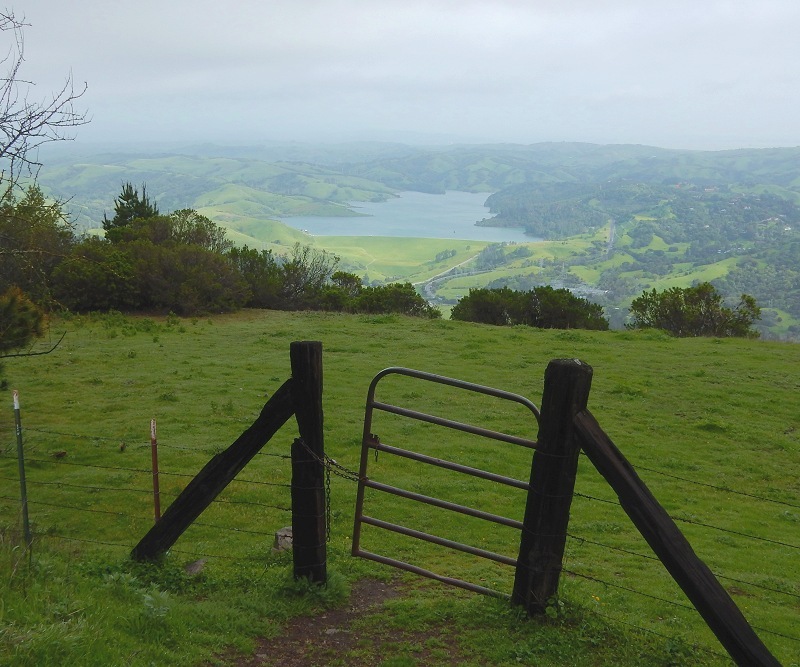 Here’s a shot overlooking Briones Reservoir on a moist day. In clear weather the Sierra Nevada takes precedence. And here’s the view southeast. There’s a lot to point out in it. 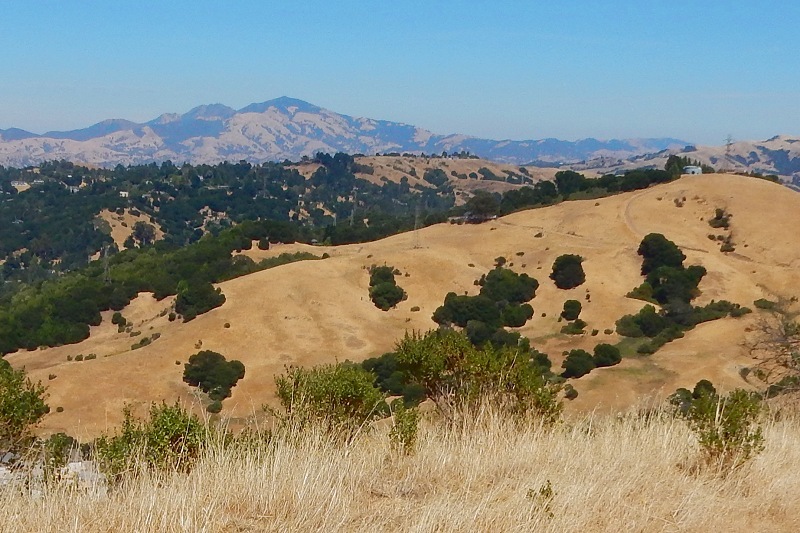 Left to right on the horizon, we see the flank of Mount Diablo, the twin humps of Las Trampas Ridge and Rocky Ridge with Bollinger Canyon between them, the Diablo Range hills beyond the Livermore Valley, and Round Top on Gudde Ridge. 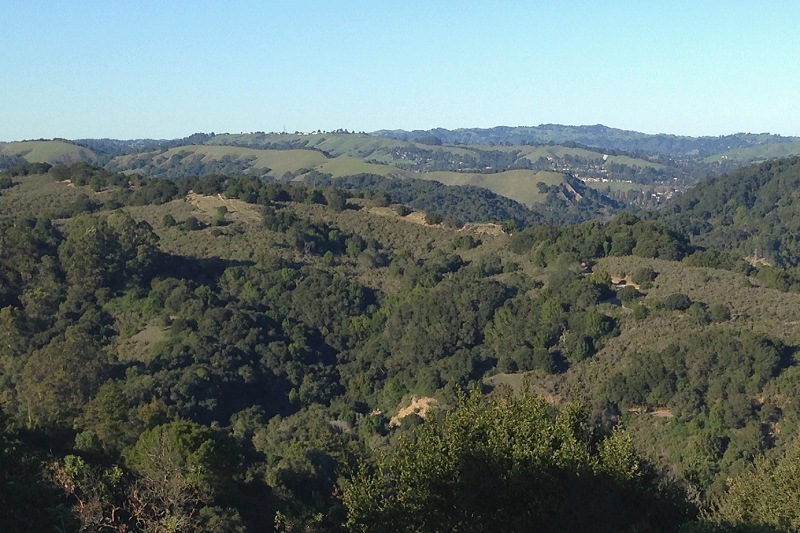 The green valley in the middle is Wilder Valley (or Gateway Valley) in Orinda, now being developed. It’s the counterpart of Siesta Valley on the north side of route 24, which we can’t see because we aren’t high enough. 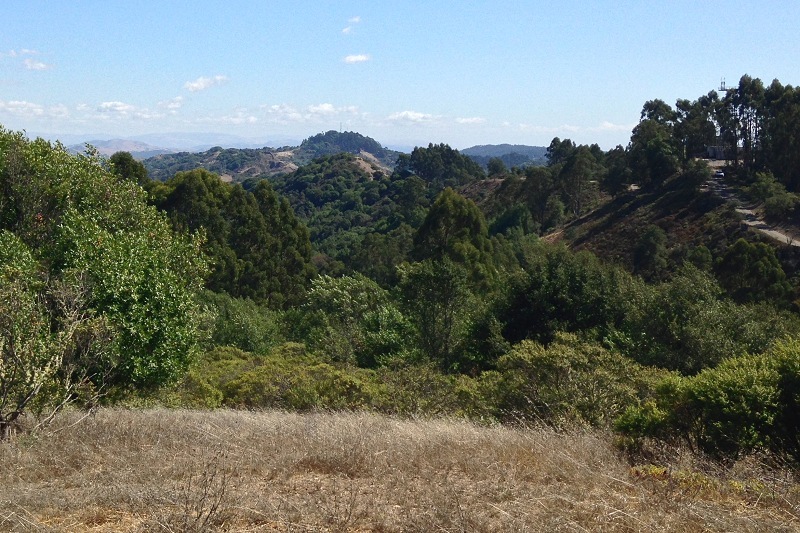 The tree-studded hilltop in the middle is Eureka Peak.